Probe is Made of 304SST With a .191-.197" Diamater, Lenghts Are As Specified in The Model Numbers, All Models Include PFA Insulated, PFA Jacketed Cables With SST Flex Amor. 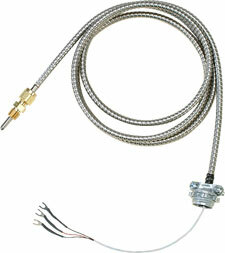 Terminations Include Spade Lugs and Heavy Duty Connectors Standard. These RTD sensors are used extensively in plastic processing equipment and other rugged environments. These sensors are typically installed using the supplied 1/8NPT brass compression fitting, other fittings are available. Nota: For other lengths of armoured cable, change “60” in model number to length desired and add $3.50 per foot over 5' (60"). For other probe lengths, change “2” or “4” in model number to length desired and add $5 +$1 to the price for each inch over 6". For high temperature construction (500ºC), add “-CC” to the end of model number and add $10 to price.